My Namsen guide's fly box. The powerful rivers of Norway produce the largest Atlantic salmon in the world. Early angling pioneers first fished there in the 1830's and since then it has been a Mecca for anglers keen to pit their skill against these leviathans. Each year a large number of 30 lb. salmon are landed and specimens nearer to 40 lb. are not going to make it into the newspapers. Such is the amazing quality of the fish that Norwegian rivers produce. As fly fishing has developed through technology, tackling these rivers with a fly rod has become much easier. Adoption of shooting heads and Underhand casting or Spey casting techniques has opened up lots of fly fishing areas. Through choice of flies and various densities of lines, anglers are able to present flies to fish that would have been quite unreachable thirty years ago. Fly fishing as a method is therefore gaining steadily in popularity and with it the proportion of large salmon caught on fly is rising each year. Recommended tackle for Norway is a rod between 13 and 15 foot for Spey or underhand casting. A matching floating line, a sink tip line and a sinking line. Alternatively a reel loaded with running line for shooting heads, with a variety of different heads for underhand casting. Dressed flies covering sizes 12 through to 4 and a selection of tube flies from about half inch to two and a half inches complete the essentials. Local flies are mainly black, green and orange mixtures and silver bodied flies are popular. Namsen offers a tradition of salmon fishing that goes all the way back to the 1850s, when the river was known as the Queen of Salmon Rivers. It is still one of the most productive rivers in Norway and we can offer you a fair chance to catch a big Atlantic salmon. 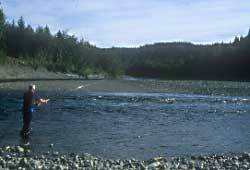 The upper parts of the river are particularly suitable for fly fishing either from boat or shore. The Namsen is a powerful river and in most places it is fished using the harling technique (from a boat) or wading with a double handed fly rod. Those who prefer small rivers and single handed rods should try the Sanddola in Grong and Soraa in Hoylandet. Stjordal is a beautiful river set in a magical valley, along with its tributaries the Forra and Sona, it is regarded as one of the best fly fishing rivers in Central Norway. Salmon up to 40lbs are caught on occassions. At Einang there is a good combination of long pools and areas of rapid currents, the lower part has an exciting holding pool. Anglers used to fishing rivers such as the Scottish Dee, Spey and Tay will find this a very similar river, with magnficant surrondings. The choice of flies are usually individual, but among the favorites are tubeflies like Sunray, Shadow and Garry or GP. At low water some people fish with small flies, and current examples are "Heggeli", "Thunder & Lightning" or "Mallard & Claret" at size 6-8. My best flies in Norway have been the Ally's Shrimp, Cascade and a Black & Yellow tube fly. Sea-trout fishing is popular in late July and August. Fishing licences are available at sports shops and camp sites, some gas stations, and at the Tourist Information Offices. You can purchase a one day card (24 hours), three day, weekly or various season cards. The angler usually decides on the time of the day he wants to start fishing. The fishing season is from June 1st. - August 31st. Every angler is obliged to become familiar with the fishing rules, such as seasonal tackle etc. Tourist Information Offices can provide more information about the rules. Everyone over 16 years of age must pay a State licence to fish for salmon, sea-trout and inland fish. The fee can be paid at any Post Office or bank. If the Post Office is closed, usually payment can be made at a Tourist Information Office.